In my teens I was member of the local youth center. They organised heaps of activities : parties, films, playback-shows, spaghetti-nights,… and each year they organised a trip to Torhout/Werchter… which is nowadays better known as Rock Werchter, the big music festival which is held every year at the beginning of July. In 1987 I went to this music festival for the first time, but this quote is all about the time I went in 1988. On July 3rd to be more precise… just over 28 years ago that is (my god I’m getting old!). Off we went, a bus full of youngsters (and not-so-youngsters) from the youth center… Werchter was the destination! That day is written in my memory for the rest of my life! It would be the first time I’d see and hear Bryan Adams of which I was a super fan. My room was filled with posters from the Canadian rock-star, I saved clippings out of magazines and I spent my pocket money on his albums. As you can imagine I was overjoyed that 3rd of July in 1988… the weather had been grey and wet all day long, but I couldn’t be bothered. The music was great, the company was fab and when the evening started to fall I made my way through the crowds to be as close to the stage as possible. It started pouring but I just didn’t care as Bryan Adams took the stage. I danced, jumped and sang throughout the entire concert. Oh how sweet my memories are of that wet night in July 1988… I cannot even begin to explain! It surely is one of the happiest memories of my life. And of course we were one hell of an audience… he had all 60.000 of us eating out of his hands! 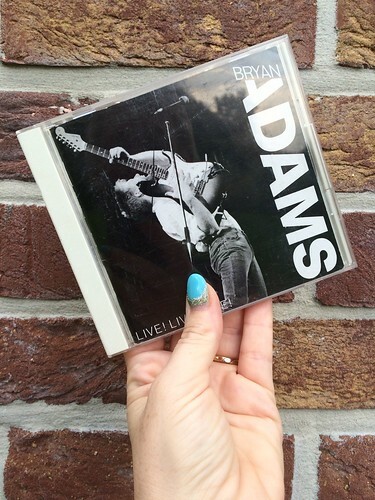 A couple of years later (I was still a fan but the hype had slowed down a bit I must admit), I stumbled upon a CD from Bryan Adams… “Live! Live! Live!” To my great surprise I saw that this CD was recorded in Belgium… in 1988… on July 3rd! I just had to buy this CD even though I didn’t even own a CD-player at that time! This entry was posted in Personal, Quotes 'n thoughts and tagged bryan adams, quote, quote of the day, quotes, rock werchter. Veel plezier zaterdag! Mijn 2 dochters gaan er ook naartoe… Het belooft alleszins beter weer te zijn als toen! Inderdaad… ik kijk er echt wel naar uit 🙂 Groetjes! I had a big Bryan Adams phase when I was a teenager. I actually saw him in Werchter too, but it was Werchter Classic. His concerts are always so good, full of energy and happiness. I know about the CD, so cool that you were actually there!